What's With The Wisdom Tooth? 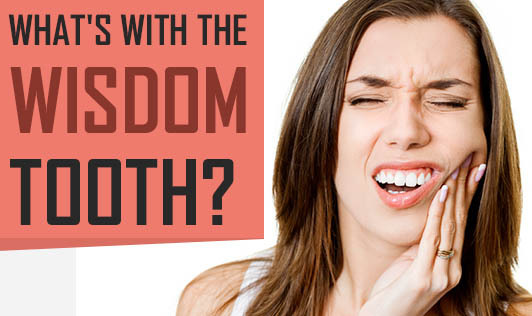 When do we know if we have a wisdom tooth? • Frequent attack of sinus and cold. • Stiffness in the jaw close to the affected area. • Inability to open the mouth widely, which may be painful. • Swelling of the mouth. • Severe ear ache, which could be unbearable. Wisdom teeth present potential problems when they are misaligned - they can position themselves horizontally, be angled toward or away from the second molars or be angled inward or outward. Depending on the problem, one should get the treatment from a dentist. Wisdom tooth that only partially erupts, allows for an opening for bacteria to enter around the tooth and cause an infection, which may result in bad breath, pain, swelling, jaw stiffness, and general illness. Partially erupted teeth are more prone to tooth decay and gum disease because of their hard-to-reach location. It is very difficult to reach them while brushing or flossing the teeth due to its awkward positioning. Poor alignment of wisdom teeth can crowd or damage adjacent teeth, the jawbone, or nerves. These problems definitely call for a wisdom tooth removal. When to remove a wisdom tooth? It isn't wise to wait until your wisdom tooth starts to bother you. Ask your dentist about the positioning of your wisdom tooth. He or she may take an x-ray periodically to evaluate for the presence and alignment of your wisdom tooth. Your dentist may recommend that your wisdom tooth be extracted even before problems develop. Removal is easier in young people, when the wisdom tooth roots are not yet fully developed and the bone is less dense. In older people, recovery and healing time tend to be longer.Extraction is done to avoid a more painful or more complicated extraction that might have to be done a few years later. In general, earlier removal of wisdom teeth results in a less complicated healing process. Please visit your dentist to know more about wisdom tooth and its removal.